Kick-Off the Season with Fun Football Promos! Are you ready for some football? Fall is fast approaching and football season is already underway! That’s right, it’s time to breakout that tailgating grill along with your favorite team colors, let’s show some team spirit! 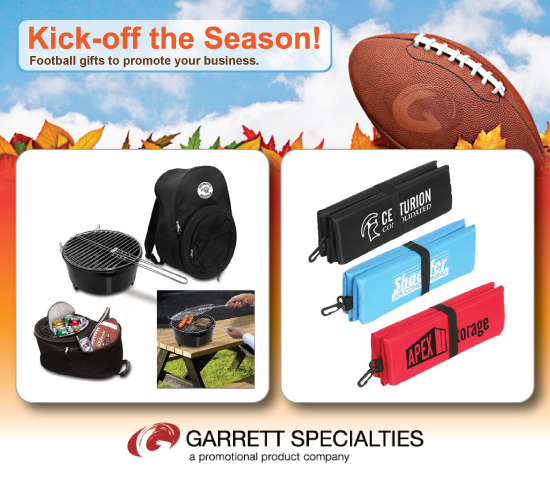 Here at Garrett Specialties we are gearing up for football season with an array of fun promotional products. So with football looming in the air, why not fall into the season with some football fun! Ever walked through the parking lot at a football stadium and thought to yourself, “that tailgating party sure does look like fun” only you don’t have a van or truck to pack your grill in? No problem, a BBQ Backpack Set will be a hit and with your company logo on it, think of the exposure. Stadiums with comfortable seats are far and few in between. So instead of your customers balling up their sweaters and using them as cushions this year, treat them to a Rally Stadium Seat Cushion. They will be sure to remember the company that made their game day a comfortable one. Maybe going to an actual game is not really something your customer base would do. There is something for everyone. Treat your customer to Sports Bag. Great to use for the gym, as a weekender or even to pack treats for that tailgating party. With so many other things going on day to day, give your customer fun football promos that are not only useful but fun too. Football products are guaranteed to score a touchdown every time! Rudee September 11, 2013 Comments Off on Kick-Off the Season with Fun Football Promos!